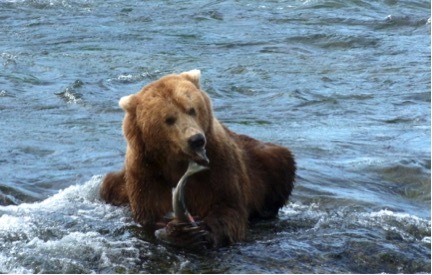 At Brooks Falls, most bears tend to focus their efforts at one or two fishing spots. 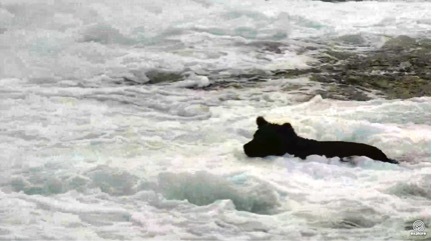 More rarely, a bear will learn to fish successfully almost anywhere at the falls. 503 has used several different fishing spots at Brooks Falls this year—the far pool, near the downed log, the jacuzzi, and the lip. Is he learning to become a generalist angler or will he eventually specialize in a particular spot? Bears from Brooks River’s past and present can offer us some insights into 503’s potential future. 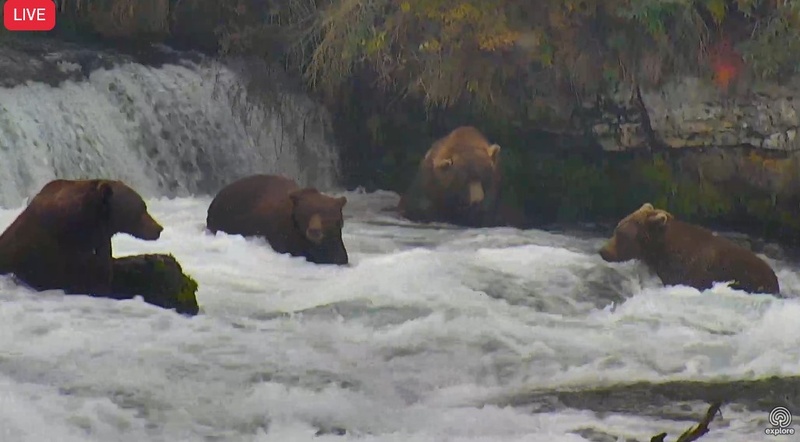 503 searches for his breakfast in the Brooks Falls jacuzzi on September 30. As a subadult and young adult bear, 218 Ugly learned to fish nearly everywhere. Like 503, we’d see him standing near the far pool, on the lip, or sitting in the jacuzzi. He’d go where there was a vacancy. 218 grew quite large in his early teens, fishing in the far pool and lip occasionally, but usually in the jacuzzi or near there instead. Even in 2013, the last year he was seen at Brooks River, 218 was still fishing multiple locations at the falls. 218 Ugly eats a salmon that he caught on the lip of Brooks Falls in July 2013. 747 fished the jacuzzi and the far pool as a younger bear when he was not nearly as large or dominant as he is now. After growing to become, in my opinion, the biggest bear on Brooks River this year, he’s generally kept to the same places at the falls as in his younger days. 755 Scare D Bear has become quite skilled at fishing in the far pool and near the log in the middle of the falls, but he’s never shown much tolerance toward the presence of people or other bears in contrast to 503. In July especially, the wildlife viewing platform where the falls cam is mounted is often full of people. Since the jacuzzi and lip are fairly close to that side of the river, 755’s intolerance of people may have prevented him from fully learning to exploit the jacuzzi as a productive fishing spot. 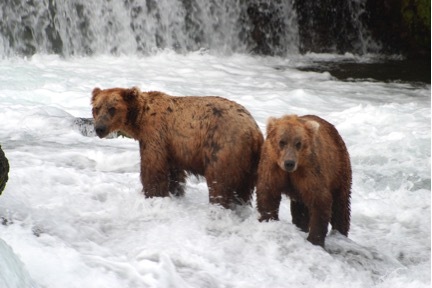 747 (left) and 755 Scare D Bear (right) stand next to each other near the far side of Brooks Falls in early July 2007. NPS photo. Successful fishing for bears, unlike the scavenging that takes place down river in September and October, takes practice. Even moving about the falls can be hazardous. 503 probably doesn’t vary his fishing spots because he’s purposefully practicing in each location. He’s fishing in those places because that’s where he can fit in. Even though he’s very big for a 4.5 year-old bear, he’s still much smaller than the mature adults around him. When the jacuzzi is occupied by 32 Chunk or 747, for example, 503 might go to the lip or far pool. If he can’t find space there he might remain near the log just downstream of the middle of the falls. Not all bears his age are able or willing to fish in multiple places at Brooks Falls. 503 seems to have the disposition and size to push the boundaries around other bears. 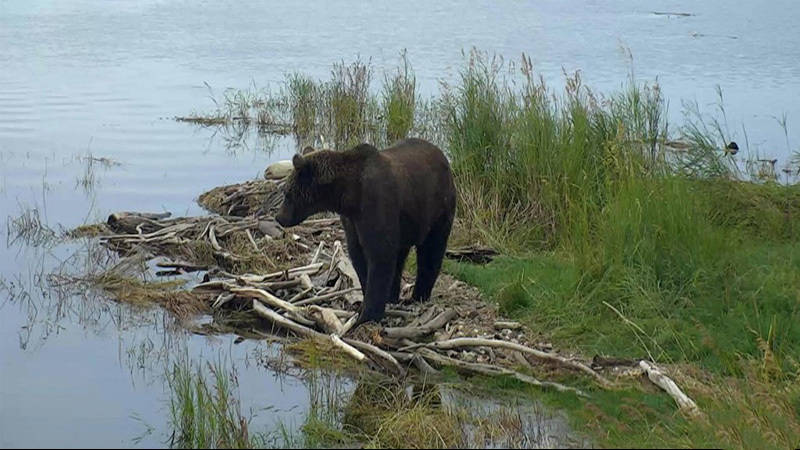 We often see him playing with other bears, and when he’s hungry he will approach a few of the much larger adult males somewhat closely in order to gain access to a suitable fishing spot. Sometimes he’s met stiff resistance, while in other instances the larger competitors have ignored him. As male bears mature, they tend to focus more and more on the fishing spots which are most productive at the falls. The jacuzzi, in particular, is extremely productive and is the most heavily used fishing spot by adult males. If 503 grows into a large adult male, we may see him focus more and more on the jacuzzi. Then again, he might surprise us. Time will tell if 503’s experiences this year set him up for success in the future. Thank You, your opinion means so much to all of us bear wachers! Thanks Mike. Great pic of 747 and 755 together. A number of these bears have known each other for a very long time and probably know exactly what to expect from each other. And thank you for the history of 218 Ugly. He is a bear who fascinates me. It’s interesting that when 503 fishes by the log, he treats it as a mini-J, staying submerged and waiting for the fish to bump into him. And the fact that a number of other bears, including adults beg from him attests to his success. 503’s disposition seems to be the most extraordinary thing about him. It has enabled him to slide pretty smoothly into the most competitive fishing area at Brooks. He has learned that 755 will tolerate him at the downed log…up to a point…and will just warn him when it’s time to leave. And he has even learned how close he can get to 747 at the J. At this point, the other boars are used to his presence and seem to accept him. Today he was feeding the masses from the J. The sub to his left is the Lip Fisher, one of the others looked like 602, not sure who the third is. (That is one of 708’s cubs on the island.) He was literally feeding himself and the three other subs. The Lip Fisher went up and took the fish from him. Absolutely love that picture of 747 and 755 as younger adults/sub-adults. Great article! Love the 2007 photo of 747 and 755 – always nice to connect to their younger selves. Thanks so much! Thanks for the valuable insight and the old pictures of the bears. This is only my second year so seeing bears who are gone and familiar bears in their early years is a treat. 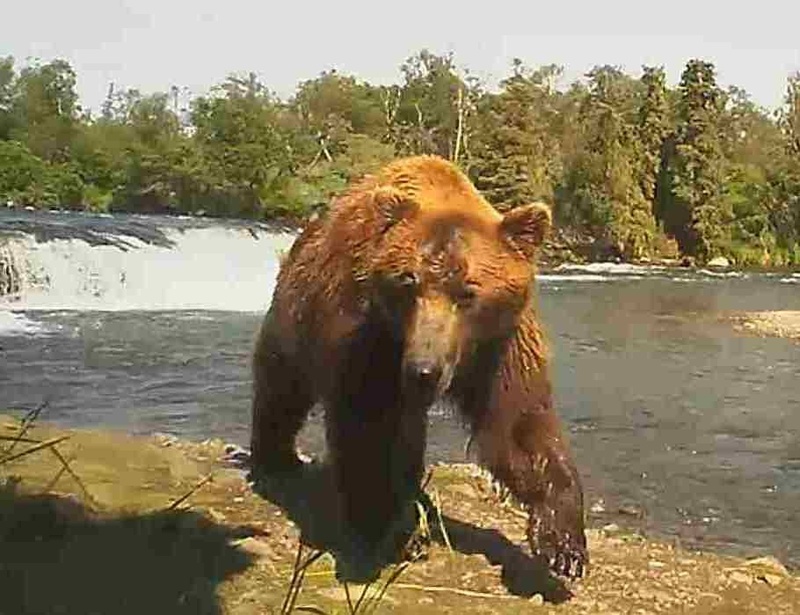 I much prefer to remember 218 “Ugly” as the beautiful bear that walked directly towards the web cam, at that time it was called River Watch Cam. (1 PIC) July 2013. What a beautiful pic Linda. Thanks for sharing. Whatever happened to Ugly? He was actually quite beautiful, as I recall. No idea:( I think, and Ranger Mike later said it might have been but not positive, that I captured him in the early daylight in 2014 on the Lower River. BUT, it was extremely difficult to see his features, except for a diamond patch on his right shoulder. So, Officially, he was last seen in Summer 2013. Thank you for sharing this with us. I loved the pictures.